Learn to make this chic bangle and dress it up any way you like, or not. 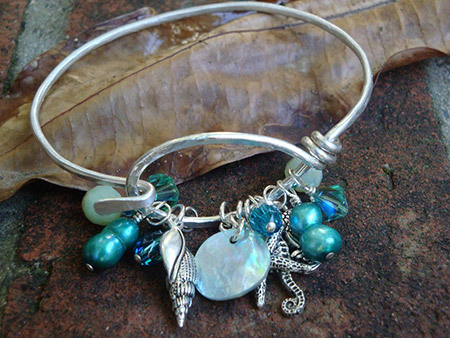 Students will learn to form heavy gauge wire into a bangle with a built in catch. Embellish if you wish with beads, pearls, charms, etc. Texture the wire or leave it smooth. Note: Good hand strength is required to manage 12 gauge wire. Kits are available from Kat for this workshop. Please contact Kat by email kat@KatDesignsUSA.com if you would like to enroll. Download a PDF information sheet.